A recent study led by scientists at the University of Washington and published in the journal JAMA Psychiatry linked maternal infection during pregnancy to neuropsychological disorders including autism, depression and even suicide in the offspring later in life. In this study, 1.8 million of people born in Sweden were followed from birth to age 41, the risk of neuropsychological conditions was assessed in relation to fetal exposure to maternal infection with hospitalization during pregnancy. Results showed a 79% higher risk for autism and 24% higher risk of depression in children and adults exposed in utero to maternal infection. It is important to note that increased risk for autism and depression were similar regardless of the severity of the infection as seen by comparing severe infections such as sepsis, pneumonia, meningitis or chorioamnionitis versus uterine tract infection representing a more limited type of infection. It is important to note that Autism etiology is complex and involves genetic, environmental and immune factors. Inflammatory exposure during pregnancy may be be the trigger in people with genetic susceptibility. The increased risk for depression in adults exposed in utero to maternal inflammation may be due to an alteration in placental serotonin production and to the impairment of serotonergic neurons in the fetal brain (1). These findings don’t come as a surprise as many previous studies in mice showed that the induction of inflammation during pregnancy, with a viral infection that triggers maternal immune activation (MIA), affects fetal brain development with dramatic consequences on pups that develop autism-like behavioral abnormalities (2-4). 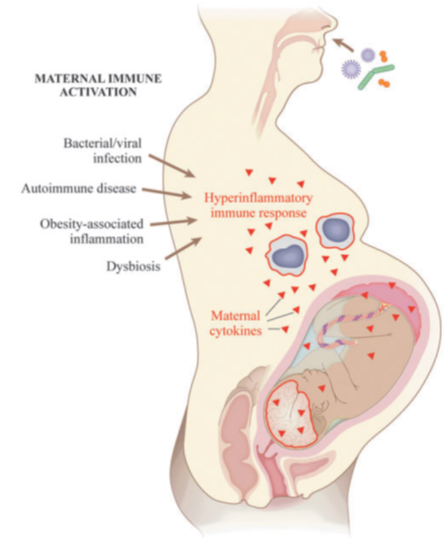 In addition, a recent study puts into light the role of the gut microbiome in modulating inflammation through IL-17 cytokine during pregnancy thus impacting neurodevelopment in the offspring. This study was discussed in one of our previous blogs. Dysregulation of the inflammatory cytokine IL-6 has also been reported in the maternal serum and amniotic fluid during early- or mid-gestation of autistic children (7). Unlike other cytokines, IL-6 can cross the human placenta and directly alter the placental environment thus impacting the fetus (8). Further and most importantly, when inflammation is triggered during pregnancy in genetically modified mice able to secrete IL-6 but lacking placental IL-6 receptor (resulting in a non-active IL-6 signaling pathway), no behavioral abnormalities have been reported as compared to offspring from mice with an active IL-6 signaling pathway (9). This clearly shows that IL-6 pathway in placenta is required and responsible for relaying inflammatory signals to the fetal brain and impacting its development. We, at Braverman Reproductive Immunology, have for years, been offering a complete immune screening panel before pregnancy and a tight monitoring during pregnancy to detect any immune dysregulation potentially dangerous to the pregnancy maintenance and your baby development, including IL-17. When detected, our timely therapeutic interventions attempt to restore a tolerant immunologic state to minimize the occurrence of obstetrical complications and potentially reduce the risk of neurodevelopmental damages to the growing fetus. In addition, we have developed a line of dietary supplements including our probiotic supplement “ENDO-Optimize probiotic” helping to keep control of your inflammation.